For you regular followers, sorry there was a missed week here at the HC – you know how things go. Part of what delays me when I do delay is finding something that is really interesting to talk about. So if you’re curious about anything to do with the history of Toronto, drop me a comment on any page on the blog. Otherwise, keep checking back in for a new post, I do hope to continue my weeklies even if my Hogtown Criering has occasionally been Hogtown Whimpering. 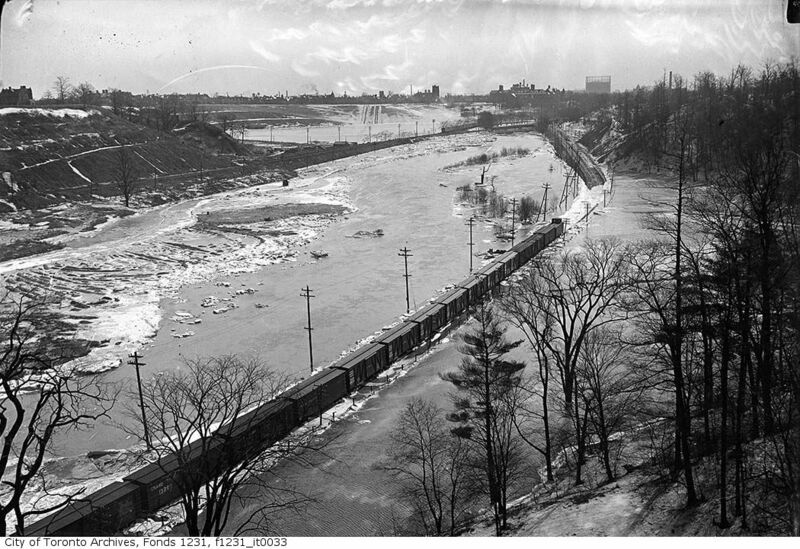 It’s no secret that the Don River floods all the time. Any time Toronto gets serious rain, it’s probably time to leave the car at home and bust out a jetski to commute downtown. Take this article about heavy rains last June, for example. An interesting snippet of history is that part of the river was actually intentionally straightened out at the end of the 19th century. 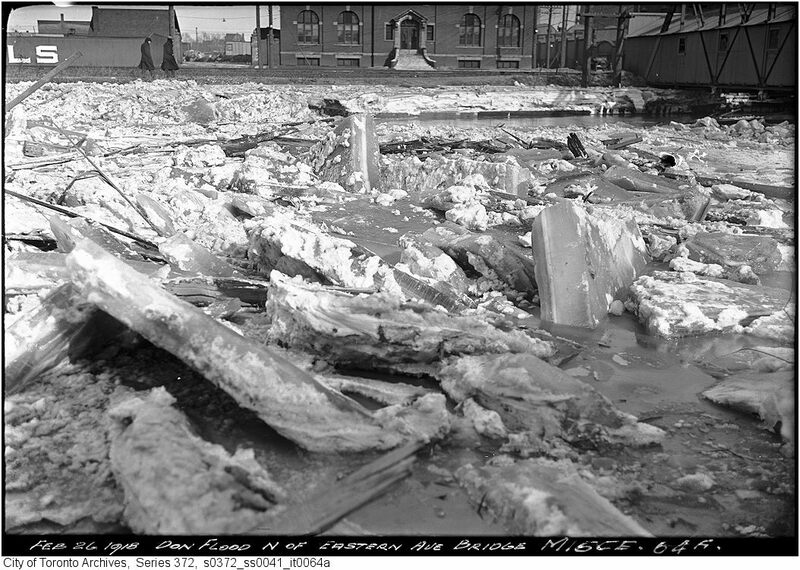 There were worse floods than the one on February 26, 1918, but there are some pretty interesting tidbits of this unique flooding of the Don that I want to share. 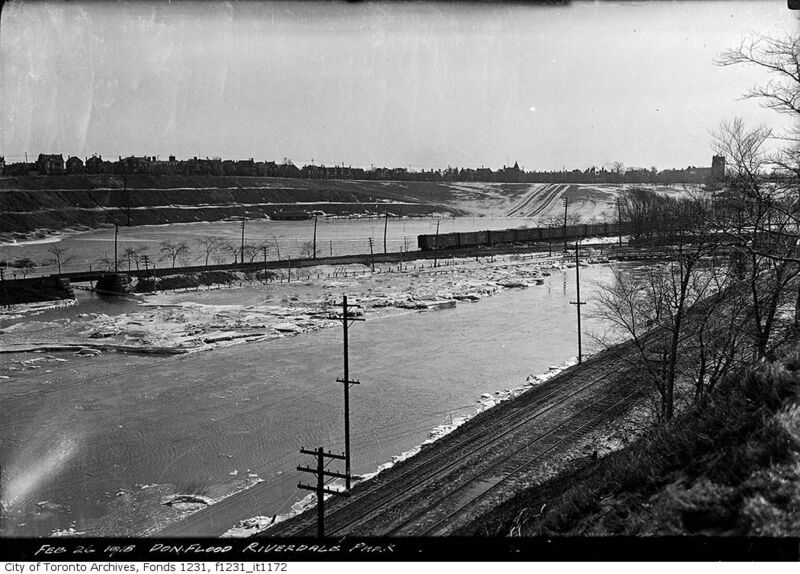 Starting in the late evening of February 25 there was a some heavy rain that started to bring up the water level of the Don. It kept going through a good portion of the night, but what really created issues was when huge chunks of ice from further up the river broke off and joined the flow. Not only that, but it was so cold that some of the areas that had been flooded slowly started to freeze over by the time the water had stopped coming in. Looking North from Queen St. Kind of looks like a road to Atlantis or something. As you can see, one industry that had the potential to be most affected was the railway industry. 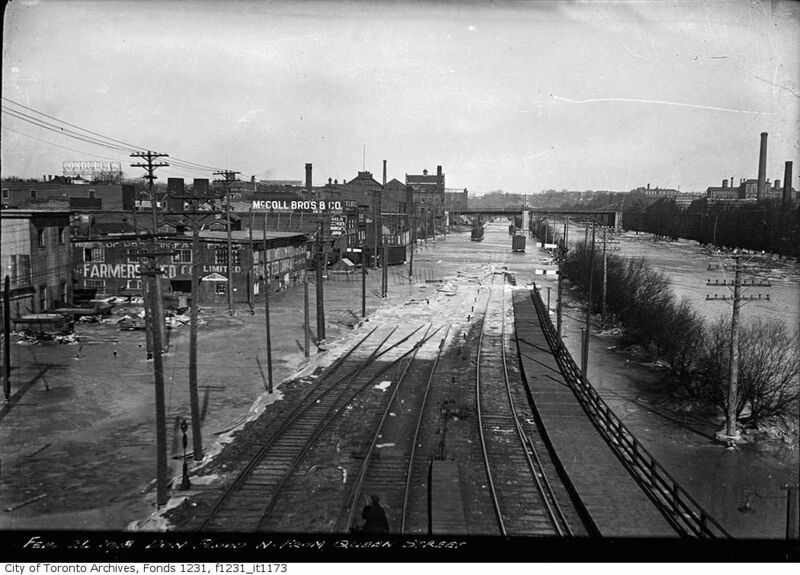 In this particular flood, a C.N.R rail yard got it the worst by far. A bunch of guys got stuck in both the roundhouse and on trains in the middle of the yard. A few were rescued initially, but some about 8 of them had to wait it out until the water subsided and a boat could come get them. It’s all good though, they were able to stay in the heated passenger car. I think I would actually enjoy getting to chill in one of those for a few hours in the middle of my shift. Especially if I had access to the dining car. Here’s where it gets pretty bad though. 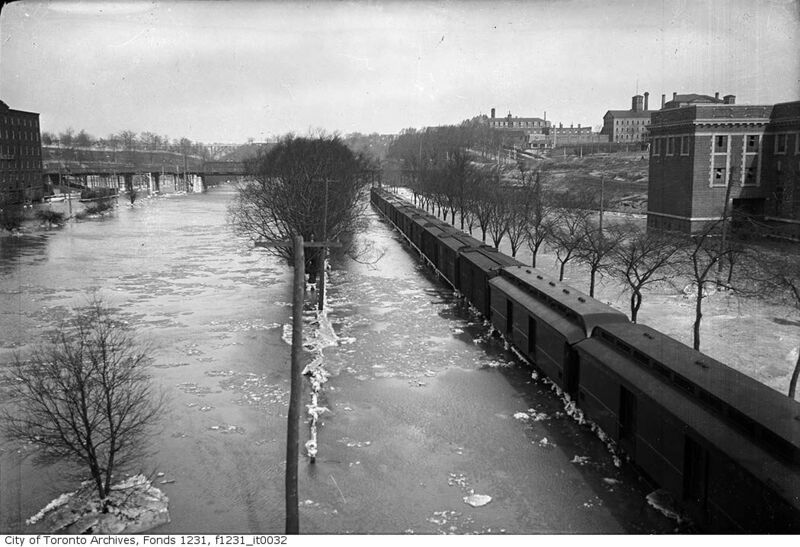 There were about 200 train cars that got affeced by the heightened waters, containing lots of perishible goods. It’s estimated the C.N.R lost about $10,000 worth of merchandise that morning alone (that’s over $150,000 in today’s money). Not only that, but there were some pretty dramatic scenes as some tracks got washed away and cars got pulled out. You have to remember at this point the Don River was still kind of the border of Toronto. Hence why it looks even more like a barren waste land than one might think it should. Of course, other places got flooded too. 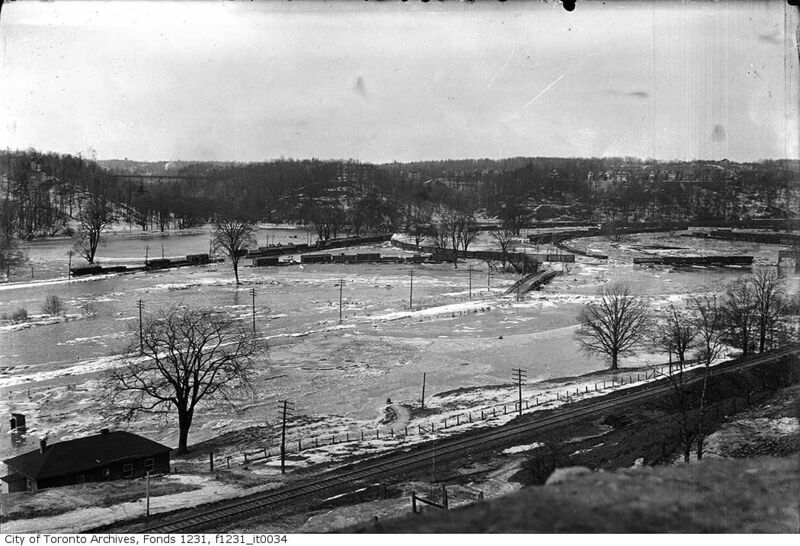 Riverdale Park, a bunch of warehouses along the river, some stables that were at the Don River and the Esplanade. They mostly escaped unscathed (or…unsoaked, I guess) from this one, but it looks like some of the cleanup must have been a hefty undertaking. Brrrr. I know it looks like giant chunks of styrofoam, but I assure you it’s giant ice. Styrofoam hadn’t even been invented, so…there’s that! This is actually a couple days later. You can see the chaos has died down a bit, but Riverdale Park is still swimming. After a few days things started to ease up and serious cleaning efforts were underway to rid the surrounding shores of the debris. Recently they have been looking into solutions to try and do something about this issue in Toronto, but there’s nothing concrete in place to ensure the Don Valley Parkway doesn’t get flooded every spring/summer. I personally kind of like the idea of being forced to pull out a canoe to go down the street, provided the only thing affected is the street. Anyway, that’s it for this week. Remember to leave a topic idea if you want me to look into something on your behalf!